Star Racing driver Michael Ray set new career best records for himself and new company records for Star Racing as he rocketed to the No. 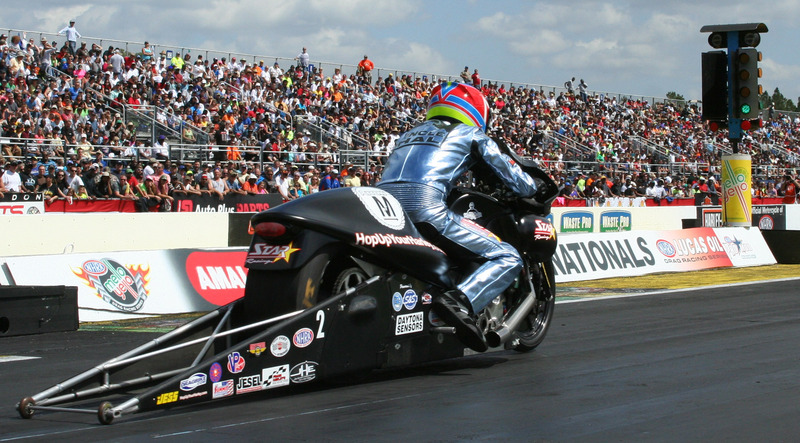 1 qualifier position at the season opener for the National Hot Rod Association’s (NHRA) Mello Yello Drag Racing Series Pro Stock Motorcycle class this past weekend March 14-16. Ray’s top qualifying pass of 6.793-seonds at 197.74 mph was the Pro Stock Motorcycle low ET and top mile per hour for the entire weekend at the Amalie Motor Oil NHRA Gatornationals event at Auto Plus Raceway in Gainesville, Fla. 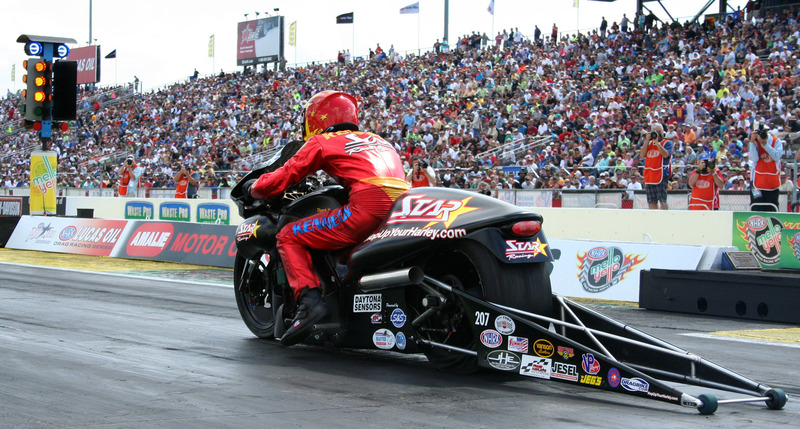 This fourth round qualifying pass set new ET and top speed records for both Ray and Star Racing, surpassing all previous numbers set by the company during their 31-year career in NHRA Pro Stock Motorcycle competition. Ray also posted the top incremental times and mile per hour for that round at every marker except the 60-foot, which was still the second best of the round. 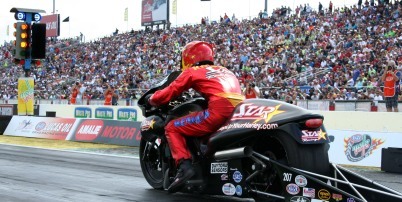 Ray’s teammate, Rookie of the Year contender Chaz Kennedy, qualified 13th with a 6.892-second pass at his Gainesville home track during his first NHRA Gatornationals event, which also marked his fourth Pro Stock Motorcycle career appearance. “When I was asked how we went a 6.79 at 197 mph I said ‘It’s all thanks to lots of people – lots of people!’ The guys at the Star Racing shop that don’t get recognized – Derek, Ron, Greg, Derrell, Randal, Toby, Jacob – these guys are really just as important as the ones that we all see out here jumping around and acting stupid when the big numbers come up. We also have a lot of people helping us put the funding together so that we can afford to go this fast. There are about 10 people that just want to help us race NHRA because they love Star Racing, Michael Ray and Chaz Kennedy,” Star Racing co-owner and team crew chief George Bryce said. As the No. 1 qualifier, Ray was up against No. 16 qualifier Fredrik Fredlund for the first round of Sunday eliminations. Ray’s 6.907-second pass during Sunday’s warm conditions easily took the win against Fredlund’s 7.274 run, advancing Ray to the second round to face Scotty Pollacheck. “I think it’s every team’s goal to show up at the Gators to be No. 1 qualifier and to be the fastest with low ET and top speed. Especially for us to come out of the pre-season sponsorship issues and run those numbers, that shows that we’re really here to focus on racing. I think for us to go low like we did just shows that we came out ready for battle,” Ray said. In round two, No. 8 qualifier Pollacheck left the line first and posted a 6.911 for the win against Ray’s 6.916-second run. “We had a really good weekend overall. You always have the goal of winning, but we came out showing that we have good horsepower. I know that on my end you can’t win in Pro Stock Motorcycle by going 0.060 (seconds) on the tree, but I wanted to avoid last year’s habit of red lighting. We had a great start to the season, though, and we left the track with a lot more points than we did last year. Like George said, there are many, many people to thank, and I’d just like to say hats off to everybody at the Star Racing shop for their hard work all winter,” Ray said. As the No. 13 qualifier, Kennedy knew he would have to be quick on the tree in round one eliminations to earn his first NHRA round win against his opponent, No. 4 qualifier Andrew Hines. Although he was 0.011 seconds quicker leaving the line than Hines, Kennedy’s 6.943 pass was not enough to claim the win against Hines’ 6.899 run. “There was something every qualifying round that could have made it better – whether it was able to give Andrew Hines a run for his money first round on Sunday. The main thing I could have done better is to cut a better light to get my first round win against him. I’m proud to say I’ve qualified for all four races, though, and I have really high expectations for what’s to come this year,” Kennedy said. The Star Racing team was happy to see that the hard work put in during the winter off season was justified by the strong performance numbers they posted over the weekend at this season opener for the class. “I was interviewed at the starting line after the 6.79 showed up, and I was so excited that I didn’t see the mile per hour. All guys that work on engines for a living will tell you that the mile per hour shows the horsepower. In the past, we’ve always been good as a team to have great short numbers – like the 60-foot, the 660 – but we haven’t shown many big horsepower numbers like that where we’ve gotten top speed of the meet. Being able to claim that No. 1 qualifier spot, low ET of the meet and high mile per hour of the weekend really made it a great start to the season,” Bryce said.